BEST is a new biomedical multi-disciplinary research initiative at The Royal Veterinary and Agricultural University which has the ultimate goal of preventing obesity, insulin resistance and the development of the metabolic syndrome in humans through a better understanding of interactions of food components and their effect on human health. 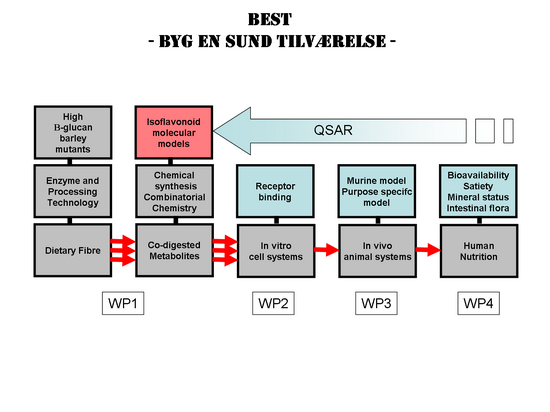 It is a multi-disciplinary effort combining basic research within plant biotechnology, microbiology, chemistry and cell biology with in vivo experimental and clinical disciplines within veterinary as well as human medicine. At present there are 54 persons affiliated to the project and a total of 8 PhD's and Post Docs are working full time. The title is an acronym which in Danish is "Byg En Sund Tilværelse" which could be translated to "Build a healthier living". The project uses isoflavonoids and beta-glucan fibers as examples of healthy food components. 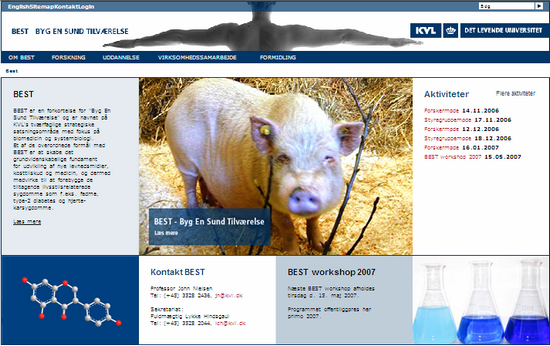 The website of the BEST project is: www.best.life.ku.dk (unfortunately there is no information in English yet). 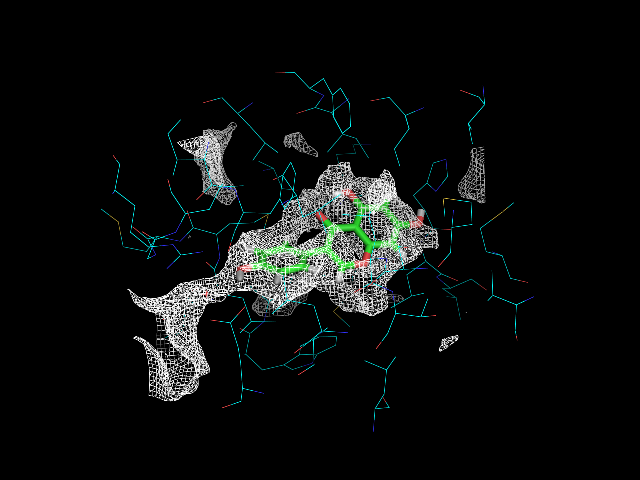 The green and red “fat” molecule in the middle is the isoflavonoid, the blue, cyan and red “lines” are the receptor site of the estrogen receptor, and the white grid is the energy field a probe would have in the receptor site. From this picture one can clearly see that genistein (isoflavonoid) fits nicely the energy field of the receptor site.